Gaviscon and Gaviscon advance are types of antacids prescribed commonly for dyspepsia (acidity) and heartburn. Antacids are drugs used to neutralize and balance the acid present in the stomach. This acidity can lead to heartburn, regurgitation and indigestion. Antacids treat this heartburn and belching which occurs due to reflux of the stomach acid into the food pipe. Some antacids are available in a pharmacy without a prescription, but it is advisable not to self medicate. Antacids are usually available in the form of chewable tablets as well as liquid suspensions. Gaviscon and Gaviscon Advance are both variants of antacids which are used for severe heartburn, regurgitation and indigestion. These medications have a rapid and instant action and the effects last two times more than other commonly available antacids. These can be taken safely during pregnancy. Both are available through a pharmacy only. The medications are quite similar with a few vital differences in their contents, mode of action and packaging. Gaviscon original contains Sodium Alginate , calcium carbonate and sodium bicarbonate. On the other hand Gaviscon Advance contains Sodium Alginate and potassium bicarbonate. Gaviscon Advance contains double the amount of Sodium Alginate than the Gaviscon original. Both medications principally work by forming a strong physical barrier over the lining of the stomach. This barrier is formed when the medication comes in contact with the acid in the stomach. This cover floats on the food contents in the stomach and prevents it from going up into the food pipe. In case of inflammation of the food pipe, these medications have an additional effect of healing. The vital difference between both these medications lies in the fact that since Gaviscon Advance contains double the amount of Sodium Alginate than Gaviscon Original, the barrier or cover formed is stronger and more pliable. These medications are different in there availability of flavours, and packaging. 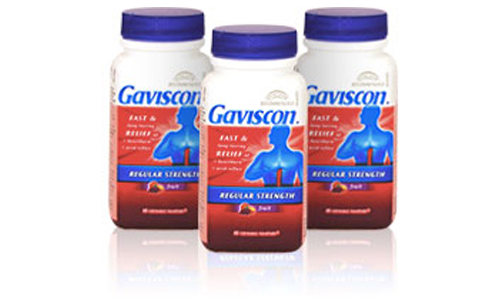 Gaviscon Original is available in the form of tablets, liquid and liquid sachets. Gaviscon Advance is available in the form of tablets and liquids. Both are available in various sizes and flavors like aniseed and peppermint. Both the medications should be taken only after a prior consultation with a medical doctor. They may interact with other medications that one might be taking and should be checked out thoroughly. Gaviscon and Gavison Advance are commonly prescribed antacids which have a longer duration of effect and rapid action in treating heartburn and acidity. Though both medications are more or less similar, the major difference lies in their contents. Gaviscon contains Sodium Alginate, sodium bicarbonate and calcium carbonate while Gaviscon Advance contains twice the amount of Sodium Alginate and potassium bicarbonate. They act by creating a cover between the food and stomach lining, reducing symptoms of discomfort experienced by patients. Gaviscon Advance has a stronger effect due to greater amount of Sodium Alginate in its composition. Both medications should be taken under medical supervision. rachita. "Difference between gaviscon and gaviscon advance." DifferenceBetween.net. April 10, 2017 < http://www.differencebetween.net/science/health/difference-between-gaviscon-and-gaviscon-advance/ >. If you have any stage of kidney disease you should not use Gaviscon Advance as it contains potassium which makes the condition worse. Stick to original Gaviscon (the UK not the US version).